Adding little arugula leaves give a peppery flavor to this delicate but satisfying salad. But any mixture of little lettuce leaves will be delicious. Wash the lettuce in a large bowl or a sink-full of cold water, lifting the leaves out of the water leaving any dirt to settle on the bottom of the bowl or sink. Shake off any water from the leaves or use a salad spinner, wrap the leaves in paper towels then store in plastic bags in the refrigerator. Greens can be prepped several days ahead of use. Pile the chopped ham on top of each egg and garnish generously with chives. Put the lettuce in a large bowl, add the dressing, and toss together until the leaves are well coated. Arrange the dressed lettuce on individual plates or a large platter and add the eggs. 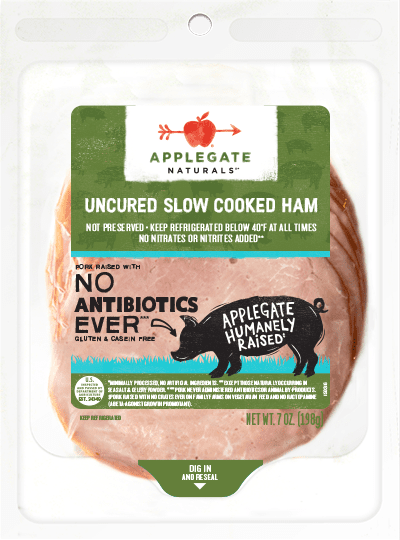 Where are you gonna find a recipe featuring natural ham that makes you feel like you're really, really giving in to your every temptation? Right here.